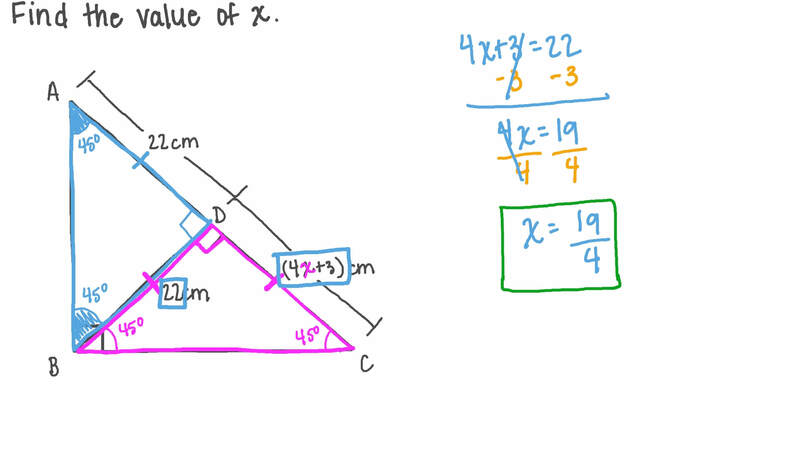 In this lesson, we will learn how to use the properties of similar triangles to solve problems. These two rectangles are similar. 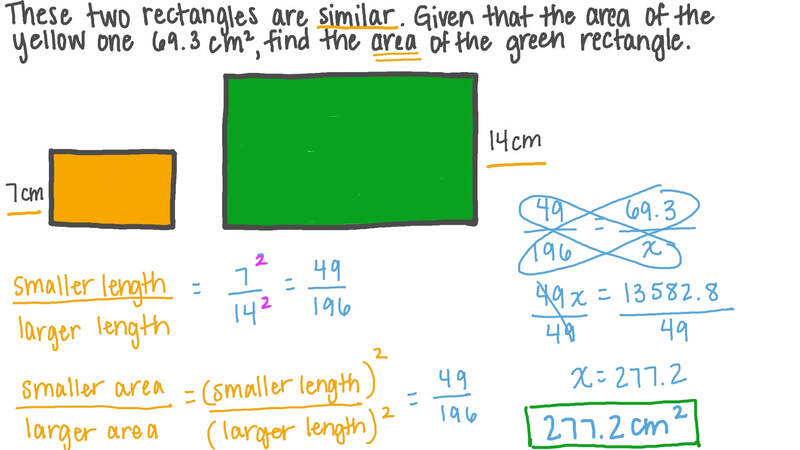 Given that the area of the yellow one is 69.3 cm2, find the area of the green rectangle. Given that 𝐷 𝐸 = 7 4 m , 𝐸 𝐵 = 3 2 m , and 𝐸 𝐴 = 4 8 m , find the length of 𝐶 𝐴 . In the given figure, 𝐷 𝐸 and 𝐵 𝐶 are parallel. Use similarity to work out the value of 𝑥 . If △ 𝐴 𝐵 𝐶 ∼ △ 𝐴 𝐷 𝐸 , evaluate 𝑥 . Given that △ 𝐹 𝐺 𝐻 ∼ △ 𝑋 𝑌 𝑍 , if 6 units are added to the length of each side, are the new triangles similar? Which of the following properties is enough to conclude that two triangles are similar? AThey have the same measure of angles. BOne corresponding side and one corresponding angle are equal. 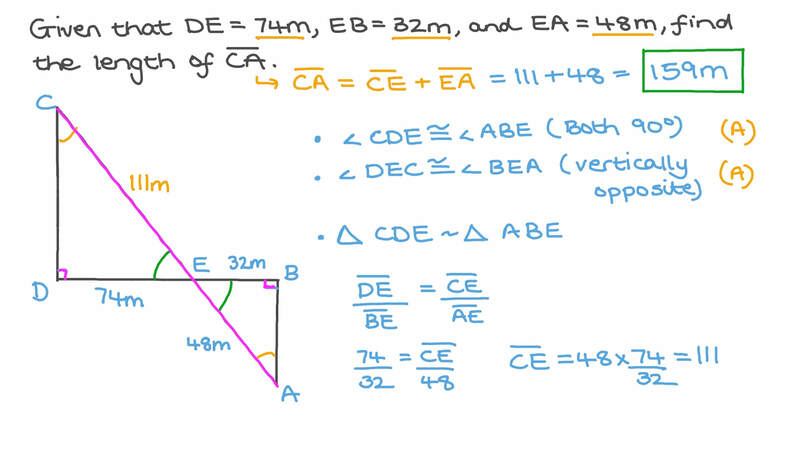 CThey both contain a right angle. DAll corresponding angles have the same ratio. ETwo corresponding sides have the same ratio. Fill in the blank: △ 𝐴 𝐵 𝐶 ∼ △ ∼ △ . Given that △ 𝐴 𝐵 𝐶 and △ 𝐷 𝐸 𝐹 are similar, find the length of 𝐷 𝐻 .
𝑋 𝑌 𝑍 is a right-angled triangle at 𝑋 . 𝐿 is a point on 𝑌 𝑍 such that  𝑋 𝐿 ⟂ 𝑌 𝑍 . If 𝑋 𝑍 = 1 9 c m and 𝑋 𝑌 = 8 c m , calculate the lengths of 𝑌 𝐿 and 𝑋 𝐿 . Round your answers to the nearest hundredth. Triangles 𝐴 𝐵 𝐶 and 𝐴 𝐵 𝐶 ′ ′ ′ are similar. Work out the value of 𝑥 . Work out the value of 𝑦 .
Triangles 𝐴 𝐵 𝐶 and 𝐴 ′ 𝐵 ′ 𝐶 ′ are similar. Work out the length of 𝐴 𝐶 . Work out the length of 𝐵 ′ 𝐶 ′ . Triangle can be dilated by a scale factor of two onto triangle . Determine the length of . Find the size of angle . Work out the value of . Given that 𝑋 𝑌 𝑍 𝐿 is a square, 𝑚 ∠ 𝑌 𝑀 𝑍 = ( 𝑘 + 8 4 ) ∘ , and 𝑚 ∠ 𝑀 𝑌 𝑍 = ( 𝑘 + 3 3 ) ∘ , find 𝑘 . Find the value of rounded to the nearest hundredth, if needed. Triangles 𝐴 𝐵 𝐶 and 𝐴 𝐷 𝐸 are similar. Find 𝑥 to the nearest integer. Given that 𝐴 𝐷 𝐷 𝐶 = 3 7 and the area of △ 𝐴 𝐵 𝐶 = 4 8 4 c m 2 , find the area of △ 𝐴 𝐷 𝐸 .
𝐴 𝐵 𝐶 𝐷 𝐸 ∼ 𝐹 𝐺 𝐻 𝐾 𝑀 where 𝐴 𝐶 = 4 6 c m and 𝐹 𝐻 = 1 1 . 5 c m . If the area of 𝐴 𝐵 𝐶 𝐷 𝐸 = 3 0 3 6 c m 2 , what is the area of 𝐹 𝐺 𝐻 𝐾 𝑀 ? The diagonal of a small square is 3 4 of the length of the diagonal of a larger square. If the area of the smaller square is 9 cm2, what is the area of the larger square? 𝐴 𝐵 𝐶 𝐷 ∼ 𝐸 𝐹 𝐺 𝐻 where 𝐴 𝑁 = 7 c m and 𝐸 𝑀 = 2 . 8 c m . If the area of 𝐴 𝐵 𝐶 𝐷 is 1 848 cm2, what is the area of 𝐸 𝐹 𝐺 𝐻 ? If the ratio between the sides of two similar polygons is 7 ∶ 6 , what is the ratio between their areas? Square A is an enlargement of Square B by a scale factor of 2 3 . If the perimeter of Square A equals 56 cm, what is the area of Square B? Give your answer to the nearest hundredth. It cost 3 , 7 9 9 p o u n d s to fit wooden flooring in a class with dimensions 28 m and 10 m. How much would it cost to fit wooden flooring in a similar room with dimensions 84 m and 30 m.
If 𝐴 𝐵 𝐶 𝐷 ∼ 𝐸 𝐹 𝐺 𝐻 , find the scale factor of similarity of 𝐸 𝐹 𝐺 𝐻 to 𝐴 𝐵 𝐶 𝐷 and the values of 𝑋 and 𝑌 .